What’s bad is they happily kill the innocent and injure others ALL for their own benefit. The question of their souls’ existences was mostly rhetorical. I just wish they would stand for the one who created those souls. What I despise is the tendency to not see the souls of those they so wantonly hurt. Again, I dont despise the people…just their tendencies. Thanks for the prayers. We all need them. Be blessed Tom. Meanwhile they’re worried about the Trump foundation potentially paying a fine for Trump of a few hundred dollars. Check the price of that designer gown…when there is no food or beverage in your mouth. That dress could’ve helped an entire village w/ food, water, clothing, medical and shelter needs for MONTHS. It never ceases to amaze me that the Clintons have more nerve than a bum tooth. 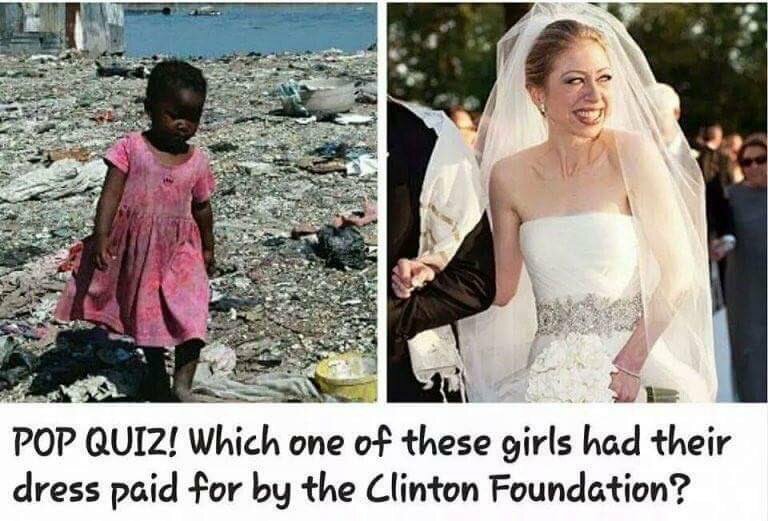 That child may well be Haitian and their foundation didn’t give funds marked for Haiti to the Haitians during their many tragedies. My own dress was about $200 b/c I won’t pay so much for a useless garment. We help the needy a lot. I don’t know how that girl smiles wearing that abomination,knowing how it was paid for. I wonder if they have souls…those helpful liberals. You pose a theological question, to which I answer: yes, they have souls. I pray for their souls, just as I do mine and yours. I know few saints, and Conservatism isn’t a pathway to salvation, that’s for sure. But the flavor of liberalism embraced by the Clintons and so many Democrats is deeply concerning in light of their bedrock support of human abortion.